StageGear Ltd., are able to offer advice, supply or installation, and at venue Calibration and Certification for Licenses. 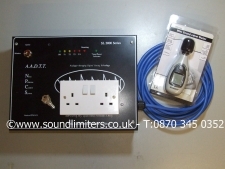 A sound limiter which monitors levels using a built in or external microphone. If a preset sound pressure level, usually set by the local environmental health officer, is exceeded for a certain period of time the mains power is disconnected from the sound source. This type of sound limiter can be used in most situations but is the only viable solution when bands or mobile DJs use their own equipment. If you own or manage a pub, bar, village hall or other establishment where live music is played you can safeguard your licence and avoid the possibility of large fines by ensuring that musicians plug their equipment into a power socket controlled by a device of this type. This type of sound limiter will usually need to be fitted by a professional installer as mains voltage connections are involved. StageGear supply and install several different models of sanction limiter, some are shown below. A unit which is connected between the mixer or sound source, a karaoke machine or CD player for example, and the main power amplifier. The unit continually monitors the sound level and reduces the volume if a preset limit is exceeded. This type of noise control system is only suitable if the sound system or at least the power amplifier is permanently installed in the venue. An example of this type of unit is the Formula Sound AVC2, AVC2D, Drawmer SPL2120, SP22, or MRC Audio EQ Limit which has data logging capability too. A sound limiter, also known as environmental noise control systems, is now a requirement in many areas of the UK for the granting or renewal of an entertainment licence. Many local authorities are insisting on the installation of an electronic sound limiter in pubs, clubs, bars, halls, restaurants, health clubs and other entertainment venues as a solution to the growing number of complaints regarding noise pollution. This information is to give a general overview of the problems and, hopefully, solutions to the more common noise control applications in entertainment situations. Full technical information is available. The information is not intended to be an answer to all problems as some situations require specialised solutions. 1: HEALTH & SAFETY AT WORK. In EU countries the law protecting people at work from high sound levels is based on the 1986 EU Council Directive 86/188. Each country has translated this directive into its own law. In the UK this is done by the noise at work regulations (1989). This law is based on the concept of a daily noise exposure. Loud sounds for a short period or not so loud sounds for a longer period can both give the same exposure. Entertainment venues are places of work and the rules apply here just as in factories. 2: NOISE NUISANCE. This falls under the environmental banner of noise pollution. Local authorities are empowered to control the noise levels in their locality sufficient to prevent noise nuisance; to impose any reasonable requirements by the issue of a noise nuisance notice served under section 80 of the Environmental Protection Act 1990 and to enforce compliance through the courts. Music and entertainment sound is all considered to be "NOISE". Many local authorities are now insisting on noise control measures in entertainment venues before entertainment licence renewal is granted. There are currently several products, (SEE PRODUCTS BELOW), which were developed purely to address the problems in these areas of concern. New legislation means that In addition to their existing powers to serve noise abatement notices and review premises licenses, as from 1 October 2006 local authorities will be able to issue fixed penalty notices in the region of #500 to the person in charge of the premises at the time of any complaint. This could be the license holder, manager or any other employee. 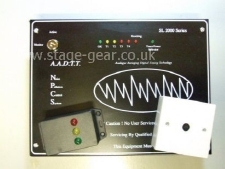 StageGear Ltd specialise in the supply and / or installation of sound limiters, our technical department can advise you on the appropriate unit for your venue. If required we can carry out the installation for you please contact our sales department for a quotation. We offer free technical support and installation advice. 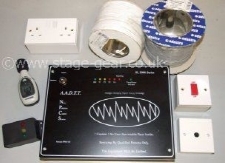 StageGear offers a do it yourself installation kit which includes most of the items necessary to install an SL2000 Noise Limiter. This include the limiter, standard remote display, hand held sound level meter cables etc. (We do not supply conduit or trunking as part of this kit). (Always consult a Competent Electrician if you are unsure about Electrical Installation Regulations). Plug and Play / Portable Sound Limiter Kit. ORIGINALLY DESIGNED by StageGear Technicians in 2004 for use in Marquees and Temporary Structures and Approved by many Environmental Health Departments. - No professional installation required. - Simple DIY fixed installation or use as a portable unit. - DIGITAL HANDHELD SOUND PRESSURE LEVEL METER. - Locking mains socket covers to prevent bypassing. SL2000 - Sound or Noise pollution control system - Sound limiter. 1 x SL2000SRD (standard remote display) - Exclusive to StageGear Ltd.
For use to control the volume of Live Performance - Live Music or Mobile Disco systems. Approved by UK environmental health departments. Successfully installed in 1000s of venues, this unit has been designed by installers to overcome the drawbacks of other products. The main control unit can be fitted at a convenient location out of sight. The remote indicator and remote sound pickup microphone are connected using low voltage cable for ease of installation. Simple to fit and operate, the SL2000 sound limiter offers the same features as more expensive systems and is local authority approved. With fully automatic operation, built in 30 Amp contactor or switching capability and built in fire alarm interface this unit offers straightforward installation and adjustment at a low price.